W ith so many great ways to spend money in San Miguel de Allende, finding a cheap Mexico flight is a terrific idea. So it helps a lot if you can find the cheapest flight to Mexico. There's no single best way to find cheap Mexico flights. It all depends on where you're coming from, when you're flying, and where you want to land. The length of your stay in Mexico makes a difference, the day of the week, how flexible you can be in scheduling. In this section I've put together some tips for finding the cheapest flights to Mexico. I hope it helps you find the best option for your own cheap flight to Mexico ticket. The largest number of cheap round-trip flights to Mexico fly into Mexico City. These are usually the cheapest Mexico flights you'll find, online or off. Mexico City flights also offer the greatest flexibility in terms of scheduling, connections and choice of airline. From some locations, when traveling to San Miguel de Allende, Mexico City may be your only option for a direct flight. BUT... once you arrive in Mexico City, you still have a distance to go to get to San Miguel. You can switch to a flight to León or Querétaro, definitely not a budget option. You can catch a bus, take a taxi, or schedule a shuttle pick-up. All these options have a price—both in time and money. So don't automatically assume that a Mexico City cheap flight is your best choice. You need to weigh all the options and costs. then a cheap flight to Mexico City can be a great option. You can also find reasonably priced flights to León on several airlines. Since Delta is currently the only airline flying from the US into Querétaro, you can't hope for a price war there. But you can watch for system-wide Delta price specials. OK, so what's the bottom line? How much is it going to cost you to get a cheap Mexico flight? Check out the best cheap flights search engine on the internet, Kayak.com and find cheap flights to Mexico from 100+ sites with one click. It searches over 100 travel sites for flights and consistently brings back the lowest prices and the most options. Insiders' Tip: Traveling in the off-season can save you big bucks. American Airlines and others often run all-Mexico specials in the Fall, so check them for a cheap Mexico flight. Other airlines often match their fares, too. And San Miguel is so beautiful at that time of year, after the rainy season is over and the wildflowers are rioting in the fields, covering whole hillsides with lavender cosmos, yellow marigolds and white casahuates and lining every road with thousands of 6-foot high Mexican sunflowers. A good travel agent can be a whiz at breaking through the fog of airline pricing. He/She will know which airlines are in a price war, what times of day or days of the week offer the best pricing, and other tricks of the trade. An agent may be the best tool in your arsenal for finding a cheap Mexico flight. Be flexible. More than once, I've saved a bundle of money by varying my arrival or departure dates by a few days. When searching airline fares, type in different dates and see if you get different figures. You can use Kayak.com to compare prices for different airlines and different dates and find cheap flights to Mexico. Fly Mexican! As in many other countries, budget airlines have sprung up in Mexico in the last few years, and they can save you serious money. 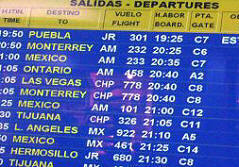 At least two of these Mexican budget airlines, Avolar and Volaris, have flights to León/BJX from Tijuana. This can make for a particularly inexpensive flight to Mexico for travelers from California. Volaris runs shuttles direct from the San Diego Amtrak station and the San Diego airport to the Tijuana airport (and back), making it a fairly simple option. You can also drive to the border, park your car on the US side of the Otay Mesa crossing for $6 a day, walk across the border and catch a cab to the Tijuana airport. I have made this flight on Volaris from Tijuana. I first caught a cheap flight on Southwest to San Diego. There was no direct shuttle at the time, so I took the trolley to the border for $2.50, walked across and took a taxi to the airport ($16). It saved me a lot of money. But I would not suggest it for a first-timer, especially if you don't speak any Spanish or are easily confused. But if you're adventurous, ignore that advice and go for it! And have an extra cafe con leche for me with the money you saved! Travel agent or do-it-yourself, there's a trade-off. For the very cheapest of cheap Mexico flights, do your own research, check online for cheap flights, and save money. And good luck in your search for cheap Mexico flights!